On January 15, 1915 the organizers of Boothwyn Fire Company No. 1 held their first meeting in an old blacksmith shop located on the northeast corner of Chichester Avenue and Meetinghouse Road previously owned by Frank Sharpless. Edwin Ervin presided and held this office from 1915 to 1921. The first building and property was purchased on Meetinghouse Road and was financed by selling shares of stock at $1.00 each with 6% interest in 1916. The original structure was located behind the site of the present building. The company was chartered on May 23, 1921 with Dr. George Boier president. The company’s first piece of equipment was a Model T Ford which had three thirty-five gallon chemical tanks. On October 8, 1926 , an American LaFrance 350-gallon per min pumper with 1,000 feet of 2 ½” hose and a booster reel with 300 feet of 1” hose was housed due to the expansion of the community. In the 1930’s, a two-story masonry addition was built on the front of the original structure to enable the company to house added apparatus and hold social affairs. A women’s Auxiliary was established who worked along with the men raising funds for the company. Strawberry and Peach festivals were popular fundraising activities. The women would carry their own pots, pans, bowls, dishes and silverware to these functions because of a lack of proper kitchen facilities. In the late 1940’s, the second floor of the building was used as a school room for first and second grades of the community, because of the lack of space in the elementary buildings. This worked well until the fire siren blew, causing quite a disturbance for students and teachers. In 1941 the fire company housed a V-8 Ford Engine. The board realized in 1949 the need for an ambulance and purchased a new Cadillac ambulance to service the community with monies raised by the members going door to door explaining the need to the residents. In 1954, land was purchased where part of the present firehouse is now located. This land was considered to be swamp land in today’s standards. It was filled with clay dredged from the Delaware River prior to starting the building project in 1955. In 1956, a new building and a fully equipped 750-gallon per min. American La France pumper were dedicated. This truck being the first piece of apparatus to be purchased brand new by the Company. 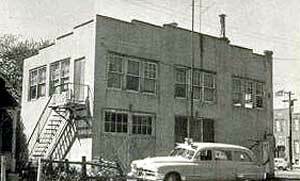 Other additions to the company’s apparatus were: 1958 new Cadillac ambulance, 1962 an International fire and rescue truck combination with all wheel drive, 1964 ambulance to replace the 1958 and in 1969 a second new Cadillac ambulance. With the new building in place, in 1956 Jake Former started Tuesday night Bingo as a fundraiser. Bingo ran weekly on Tuesday evenings from 1956 through 2002 when the company, realizing the decrease in attendance and the weekly struggle for help, stopped. Between 1958 and 1989, the Company purchased several other pieces of land behind and on either side of the firehouse property for parking and future expansions. Because the size of fire apparatus grew, the firehouse needed to also grow. In 1972, the Company added an engine bay on the right side of the 1955 structure and housed a 1972 Mack Pumper with a 1250 gallon per min pump. Around 1974, a kitchen and banquet hall were added to the rear of the building and engine bay for the Ladies Auxiliary to host larger functions and to expand the seating for bingo players. Between 1977 and 1978 a Chevy Ambulance was purchased to replace the 1969 Cadillac and in 1981, a 2 nd ambulance was purchased from Friendship Fire Company to act as a secondary or back-up ambulance. In 1980 the Company purchased a Ford E-One 1250 gallon per min. Pumper/Rescue to replace the International purchased in 1962. Ten years later, a 1990 Pierce Rescue Pumper was purchased which allowed the Company to use the 1980 Ford as a Pumper only. During the 1980’s, additional fundraisers were held by the members selling Mother’s Day and Easter Flowers and Christmas Trees. In 1985, the need for Advanced Life Support care was recognized by the member’s of the Company and Sacred Heart was invited to work out of the Fire Company along with the Company’s Basic Life Support Ambulance. Sacred Heart and the Company worked as partners until 1988. In 1987, a Ford Braun Ambulance was purchased to replace the Chevy and the Ambulance purchased from Friendship Fire Company. In 1988, Crozer was contracted to provide manpower for the Company’s Basic Life Support unit due to a decrease in volunteers. Crozer and the Company worked together until 1994 when the Company’s membership and interest grew and were able to man the ambulance on their own again. In 1994, a 1985 GMC 4-Wheel Drive Light Rescue Truck was purchased from Concordville Fire Company. The need for engine bay space forced the Company to house the 1956 Pumper outside in the side parking lot. In 1996, the Company voted to donate the Punper to New Freeport Fire Company located in Southwestern Pennsylvania . In 1995, the Company purchased a 1995 Wheeled Coach ambulance to replace the 1987 Braun. In 1999, the Company made a decision to hire 2 full-time Emergency Medical Technicians to respond to medical emergencies during daytime hours due to the lack of availability of volunteers during these hours. Today, the Company employs three full-time employees and a handful of part-time employees who assist the volunteers in responding to medical emergencies in the community. In 1998 the 1980 Ford and 1972 Mack were both sold and replaced with a 1989 Pierce pumper with a 2,000 gallon per min. pump, which was purchased from Clinton Fire Department in Maryland . In 1999, the Company purchased two apartment buildings from Louis Irvingham, directly across the street for income purposes and During 2002-2004, we added a new engine bay, banquet facility, catering kitchen and refurbished the existing structure. Along with the additions and refurbishment, Lia’s Catering was contracted to provide the catering services for the banquet functions generating the loss of income from Bingo. In 2000, due to the increase in medical emergencies in the community, the Company purchased as 2000 Ford Horton Ambulance. In 2006, due to the always increasing medical emergencies in our community as well as surrounding communities it was determined that it was time to replace our 1995 wheeled coach ambulance. A 2007 Ford Horton ambulance was bought by the company and placed in service in mid June 2007. In 2007, The Company voted to purchase a new light rescue four wheel drive truck to replace our 1985 GMC that was originally purchased from Concordville Fire Company. The Company purchased a Ford F350 pickup truck and it was outfitted with an Omaha Box. In 2012, The Company decided it was finally time to purchase a new Rescue truck. Our current Rescue is a 1990 Pierce Lance. In keeping with the Pierce tradition, the Company voted to purchase a 2012 Arrow XT Rescue Pumper. This piece of equipment has the latest technology available and it gives us plenty of room for manpower and equipment. In 2013, We celebrated the 10th anniversary of our new building. It also marked our 10th year with Lia’s catering. A partnership we hope to keep for many years to come! In April of 2014, The Fire Company voted to take our EMS services to the next level and provide Advanced Life Support to the Upper Chichester Community. The Company has been provided Basic Life Support services since October of 2003. The Company also ordered a new Medic Unit that’s expected to be delivered in late 2014. The support we have received to make this next step has been tremendous!